After yesterday’s hot weather we were sure to get an earlier start and were hiking at 6:30am. The night didn’t get as cold as I anticipated and it was already warm at 5:30am when my alarm went off. Strider left with us and Mark was still in his tent when we left. The five of us leap frogged each other throughout the morning. 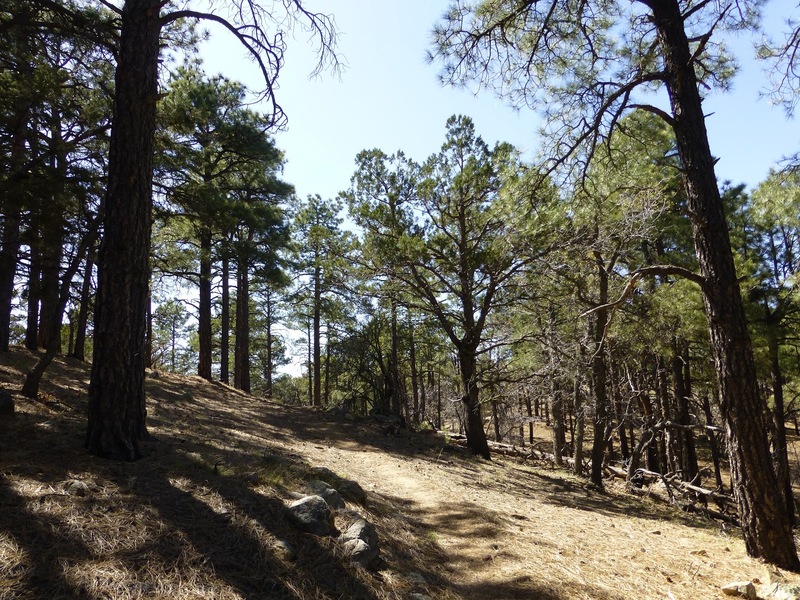 The big news is that we seemed to have entered part of the Gila National Forest and for the first time on the CDT we were walking on an actual maintained trail with trees! We all loved this preview of what we have heard is one of the highlights of the CDT. 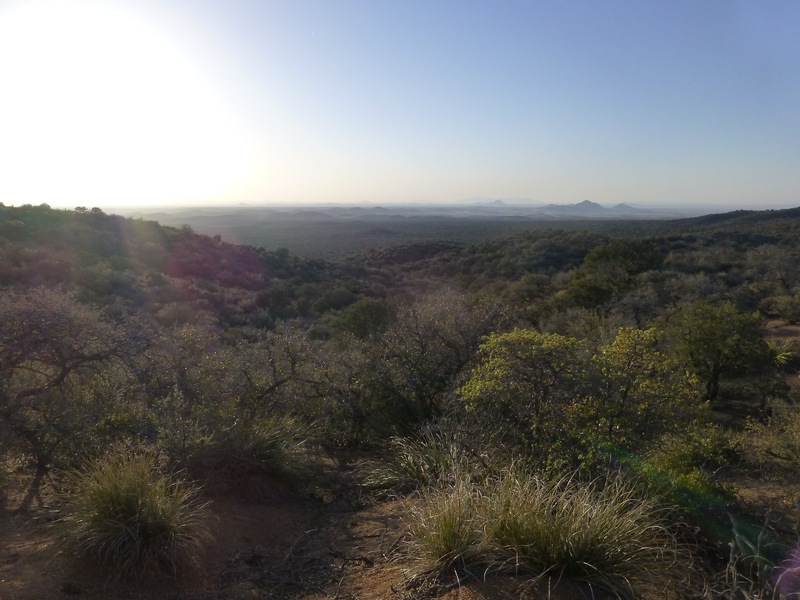 As the sun rose, we were walking up high in the hills as the trail wove up, down, and around. It was really fun! The change was shocking to us seeing as we were in the desert with almost no shade at all yesterday. I was happy to get to wear my t-shirt and shorts. 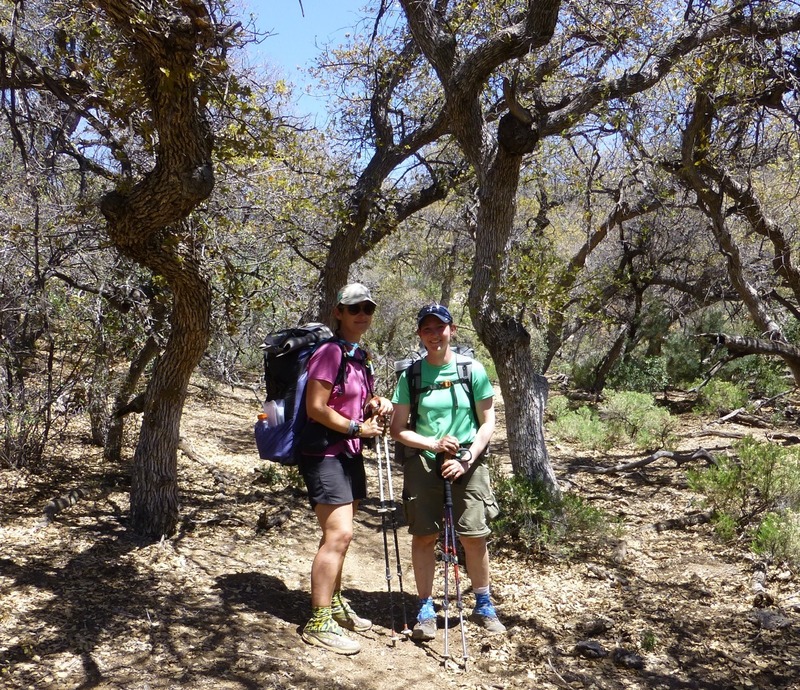 Here are Liz and I on an actual trail and in the shade of trees! The change was just so sudden and different. 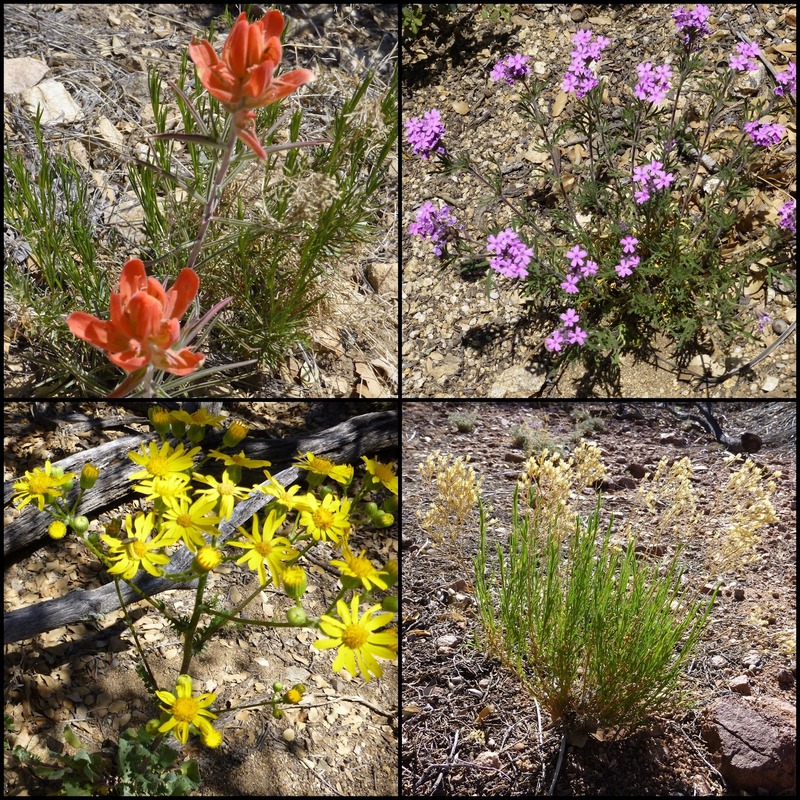 There were even colorful flowers and plants that didn’t want to hurt us! It was a workout as we climbed higher as the trail continued to twist. After a few hours, we had a short break under one of the countless trees. While there, we met another CDT hiker. His name is Dave and we may see him again. He is doing this short section southbound, so he was hiking the opposite direction as us. When he gets to Lordburg, he will get a ride back to Silver City and hike north like us. We hiked a few more hours until lunch. The trails had many intersecting trails and dirt roads with random signage at intersections. It was easy to take a wrong turn or miss a turn and it happened to some of us repeatedly. I was lucky and either had Liz with me to point out if I missed a turn or we would stop and double check if we were doubting our choice. Either way, we all got to lunch about the same time and enjoyed getting to spread out under a large shaded tree for the first time. After about an hour I started to pack up and head out on my own as the rest of the group likes a longer lunch and I decided I’m going to do the schedule that works best for my body. Strider decided to join me since we all had the same goal of getting to a spring for water another 5mi away and up a steep long climb. This was our first serious climb. 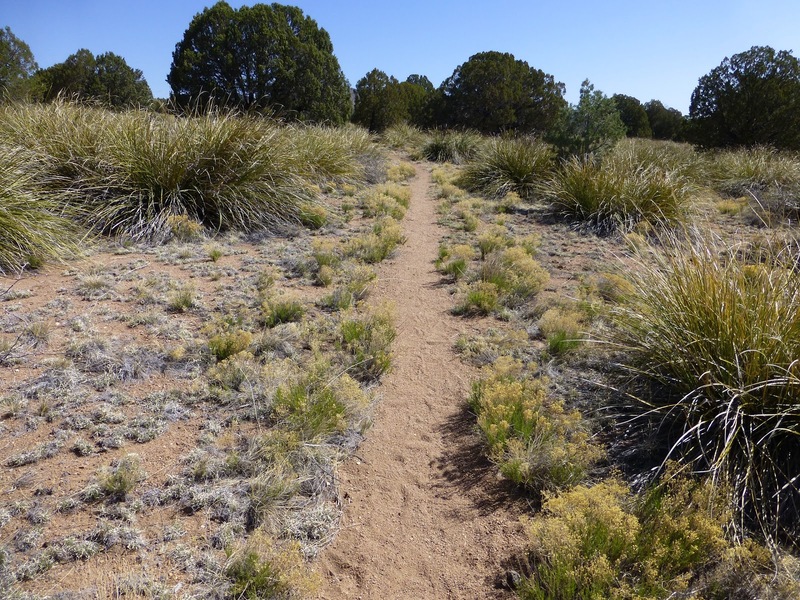 The trail wound up steeply 1,700ft into the Burro Mtns and we topped out at Burro Peak at 8,000ft. 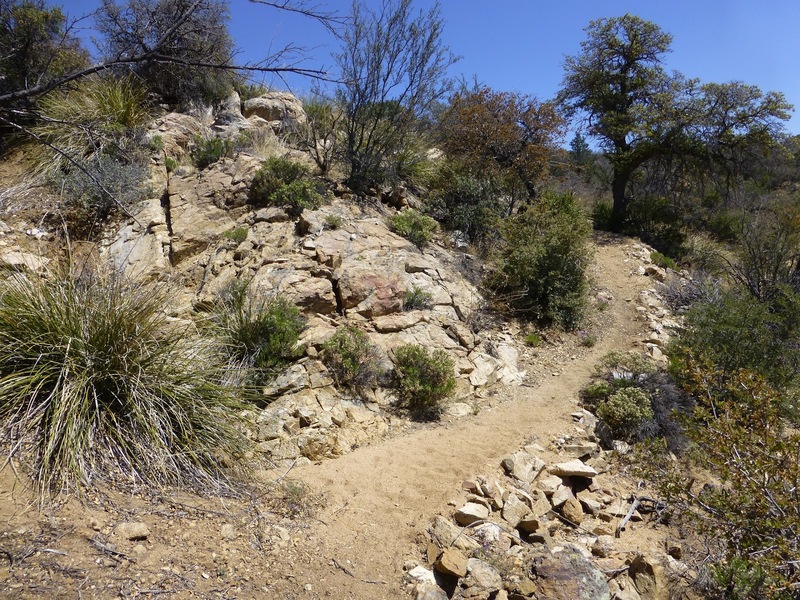 It was hot and challenging, but felt great to really feel like I was hiking again! The trail at the top became even more wooded with wonderful pine needles to walk on. I loved it! My body feels great and fat ankle was at 60-80% depending on how rocky the terrain was. It’s doing well tonight so that’s good. 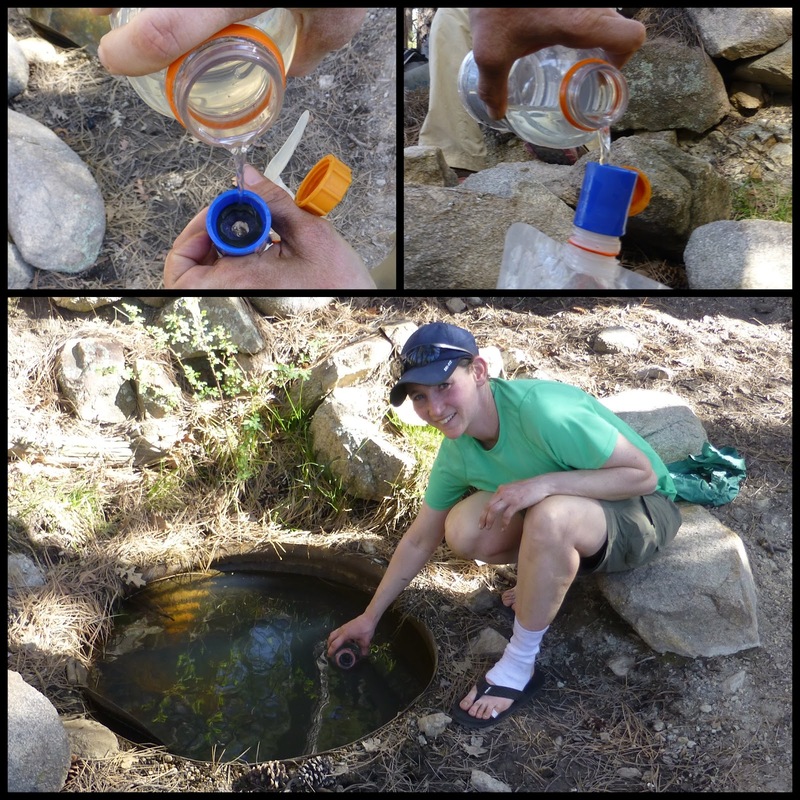 We got water at the spring called “Mud Spring.” Our first natural water source so I thought I’d show it. I use a dirty bottle to scoop the water which had plenty of dead bugs floating in it. The water was fairly clear, but I want to show everyone the prefilter I’m trying for the Sawyer Squeeze since this fairly new filter is popular and many are coming up with creative ways to use it in these situations. Fellow PCTer Pacer taught me this method…he found that tornado tubes work great as adapters for the bags and the filter. If you saw down one end of the tube, you can use the tornado tube for two purposes. One use I show here is as a prefilter with a small o ring strainer you can get at most hardware stores. See how I pour the water in and the filter catches the dead bugs and debris. You could also use a handkerchief for this process instead. Then I filter the water with the Sawer Squeeze like I normally would. This pre filtering is only needed for sources that may clog the filter easily. The second use is that the tube (sawed down) will connect your bladder to the filter from the opposite side to be used to back flush the filter. That is how I’m able to hike without the large back flushing syringe the Sawyer Squeeze comes with. Long explanation, but many ask me these things. Back to the hike…Strider and I were done stocking up on water when the rest if the group arrived Strider and I hiked on together until 7pm. The rest of the group came shortly after we got settled and found a spot to camp. I was much more comfortable and enjoyed the day today on my own schedule and routine. I hope it continues to work out. We finished the day on a hard packed dirt road. Tomorrow will be a rough day of boring road walking to the town of Silver City where we will spend the night! It is tempting to hitch, but is actually part of the trail, so we won’t. 6mi on the hard packed dirt road and then 12mi along an actual paved highway. 18mi of road walking! My feet already hurt thinking about it!